This is an In Person Signed Black and White 10" x 8" Photo of the immensely influential Singer/Songwriter. 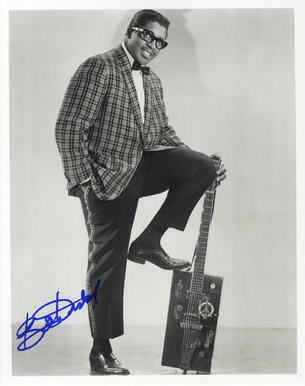 Signed at a small Privately arranged Signing Session in the U.S.A.
Bo Diddley died 2nd June 2008 from Heart Failure. Ellas Otha Bates (December 30, 1928 - June 2, 2008), known by his stage name Bo Diddley, was an American rhythm and blues vocalist, guitarist, songwriter (usually as Ellas McDaniel), and rock and roll pioneer. He was also known as The Originator because of his key role in the transition from the blues to rock, influencing a host of acts, including Buddy Holly, Jimi Hendrix, The Rolling Stones, The Velvet Underground, The Who, The Yardbirds, Eric Clapton, Elvis Presley, The Beatles, and George Michael, among others. He introduced more insistent, driving rhythms and a hard-edged electric guitar sound on a wide-ranging catalog of songs, along with African rhythms and a signature beat (a simple, five-accent rhythm) that remains a cornerstone of rock and pop. Accordingly, he was inducted into the Rock and Roll Hall of Fame and received Lifetime Achievement Awards from the Rhythm and Blues Foundation and a Grammy Award from the National Academy of Recording Arts and Sciences. He was known in particular for his technical innovations, including his trademark rectangular guitar.